Nearby Floridays RV Park in Hobe Sound, there’s a little piece of heaven called Peck Lake, known only by a few walkers, hikers, and boaters. It’s accessible only by foot or by boat, and it’s a favorite place to go for guests at Floridays. At one time this area was an inlet. Sand deposits entirely separated the ocean from the Intracoastal Waterway. This created an anchorage on the Intracoastal side. Trip Advisor names it in the top 8 things to do in Hobe Sound. They point out that access by land is a 5-10 minute walk along a boardwalk over the mangrove swamps and natural vegetation with educational signposts along the way. Scuba divers and snorkelers will find a reef covered in stony corals and diverse sponges that rises from about 32 feet to about 5 feet at the crest with ledges and caverns, holes and crevices that attract sea turtles, lobster, and reef fish. Divers venturing outside the reef’s crest can find sharks and goliath groupers and strong currents. Visibility can be poor so calm weather is essential with breezes from offshore at high tide. Because of the current, divers should swim into the current and keep track with frequent surface intervals and loop back to the boat. Scuba Stuart offers dive charters. Floridays RV Park On-site Manager, George Vryhoff, knows Peck Lake like the back of his hand. 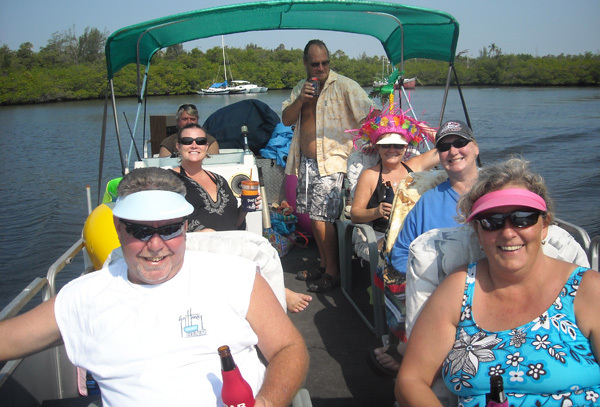 With his 24’ pontoon boat “Liquid Limo” loaded with guests from the RV park, everyone enjoys a refreshing day on the water at #PeckLake.